Dr. Roberta T. Anderson, Ph.D.
Are You Aware That Your Animal's Health Is In Your Own Hands. You, too, can assist your animal in experiencing relief from stress, acute or chronic pain, traumas, fears and anxieties through the power of touch. If you have ever felt helpless when your animal became ill, as I once did, you can learn how to use the powerful Rejuvenating Touch Techniques (RTT) I have developed to help them. Through study with experts on acupuncture, acupressure, kinesiology, telepathic communication, therapeutic touch and emotional release work I developed Rejuvenating Touch Techniques and specific sets of treatment patterns designed to reduce trauma and accelerate the natural healing powers present in my animals and those of my friends and clients. 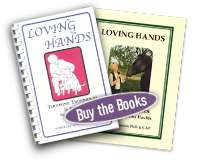 This accumulated knowledge resulted in the authorship and publication of, "LOVING HANDS, Touching Techniques to Enhance Your Pet's Health" and "LOVING HANDS, Touch Techniques to Enhance Equine Health" available on the Products page of this website. In addition to learning these Rejuvenating Touch Techniques from my books, I offer seminars, classes & events, phone consultations, and more. Check the Events and Classes page for current information. To make an in-person or telephone session appointment, please email me at info@petcareconnection.com. 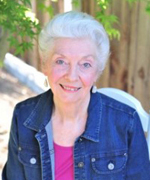 Roberta T. Anderson, PhD & C.A.P. Two inspiring transformational books by Roberta Anderson, PhD, Animal Health Care Consultant, Acupressurist and Animal Communicator are now available for purchase in both hardcover and E-versions on the Products Page of this website. 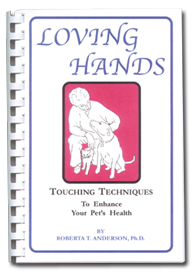 "LOVING HANDS: Touching Techniques To Enhance Your Pet's Health". "LOVING HANDS: Touch Techniques To Enhance Equine Health". Click here for greater detail. 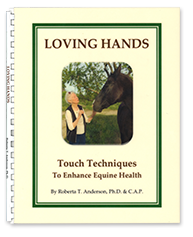 Three (5 1/2" X 8 1/2") sets of 10 each for Cats, Dogs and Horses provide illustrated guidance in the use of Roberta's Rejuvenating Touch Techniques. © Anderson & Associates 2013. All rights reserved.